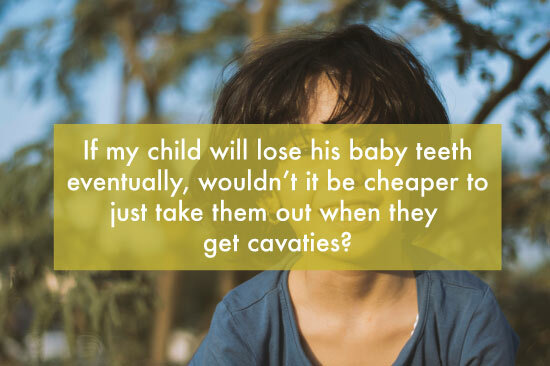 Question: If my child will lose his baby teeth eventually, wouldn't it be cheaper to just take them out when they get cavities? Answer: That really depends on the child's age and which tooth needs the filling. Around 6 or 7 years of age, children get their first permanent molars behind all of their baby teeth. When they come in, they really push their way to the front of the mouth. The only thing that naturally keeps them in their place is the baby molars. If you were to take the baby molars out prematurely, they would not keep the permanent molars in place and you'd be left with an orthodontic nightmare when they are in their teen years easily costing much more than a typical round of braces. As a rule of thumb any baby molars that get cavities before your child turns 9 will be better off saving with a filling, since these teeth don't normally fall out of their own until your child is about 11 or 12 years old. If a tooth absolutely needs to come out before its time, your dentist will want to place a "space maintainer" to keep the back teeth from drifting. This is another expense on top of the extraction, more than doubling what it would cost to just fill the tooth.